احسانی, محمد, فلاحی, احمد, کوزه چیان, هاشم, خبیری, محمد. (1395). حمایت مالی از لیگ برترفوتبال ایران از دیدگاه شرکت‌های حامی. 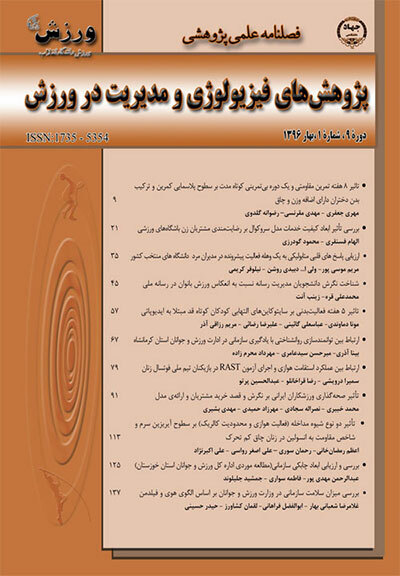 پژوهش های فیزیولوژی و مدیریت در ورزش, 8(4), 9-22. محمد احسانی; احمد فلاحی; هاشم کوزه چیان; محمد خبیری. "حمایت مالی از لیگ برترفوتبال ایران از دیدگاه شرکت‌های حامی". پژوهش های فیزیولوژی و مدیریت در ورزش, 8, 4, 1395, 9-22. احسانی, محمد, فلاحی, احمد, کوزه چیان, هاشم, خبیری, محمد. (1395). 'حمایت مالی از لیگ برترفوتبال ایران از دیدگاه شرکت‌های حامی', پژوهش های فیزیولوژی و مدیریت در ورزش, 8(4), pp. 9-22. احسانی, محمد, فلاحی, احمد, کوزه چیان, هاشم, خبیری, محمد. حمایت مالی از لیگ برترفوتبال ایران از دیدگاه شرکت‌های حامی. پژوهش های فیزیولوژی و مدیریت در ورزش, 1395; 8(4): 9-22. این تحقیق باهدف شناسایی و اولویت بندی مهمترین ملاک­های انتخاب باشگاه­ها برای حمایت مالی، مهمترین ابزارهای ارتباطی حمایت مالی و مهم ترین مخاطبان حامیان مالی انجام شد. از روش تحقیق آمیخته از نوع اکتشافی متوالی (کیفی و سپس کمی) استفاده شد. با 16 نفر از مدیران بازاریابی حامیان مالی باشگاه­های حاضر در لیگ برتر مصاحبه صورت گرفت و از فرایند تحلیل سلسله مراتبی (AHP) برای اولویت بندی عوامل استفاده شد. تحلیل مصاحبه ها نشان داد که 7 ملاک مهم برای انتخاب باشگاه­ها جهت حمایت مالی وجود دارد. ابزارهای ارتباطی حمایت مالی و گروه­های هدف حمایت مالی نیز در 7 طبقه قرار گرفتند. اولویت بندی عوامل نشان داد که برخورداری از پوشش رسانه­ای با وزن نسبی 26/0 و ارتباطات فردی مدیران (216/0) مهمترین ملاک­های انتخاب باشگاه­ها برای حمایت مالی هستند. استفاده از مزیت پوشش رسانه­ای با وزن نسبی 243/0 و در معرض دید تماشاچیان بودن (207/0) مهمترین ابزارهای ارتباطی و عموم مردم (217/0) و بازار محصول (مشتریان کنونی و مشتریان بالقوه) (202/0) نیز مهمترین گروه­های هدف حامیان مالی بودند. This study aimed at identifying and prioritizing the most important criteria to select clubs for sponsorship, sponsorship communication tools and audience of sponsors. The sequential exploratory mixed method (qualitative and then quantitative) was used. 16 marketing managers of sponsors present in pro-league clubs were interviewed. The analytic hierarchy process (AHP) was used to prioritize the factors. Interview analyses showed 7 important criteria to select clubs for sponsorship. Sponsorship communication tools and sponsorship target audiences were in 7 categories. AHP results showed that “media coverage” (0.260) and “managers’ personal relationship” (0.216) were the most important criteria to select clubs for sponsorship. “Using media coverage advantages” (0.243) and “exposure to attendees” (0.207) were the most important communication tools of sponsorship. “General public” (0.217) and “product market (existing customers and potential customers)” (0.202) were the most important target audience of sponsors. 1. الهی، علیرضا. (1387). موانع و راهکارهای توسعه اقتصادی صنعت فوتبال جمهوری اسلامی ایران. رساله دکتری، دانشکده تربیت بدنی و علوم ورزشی، دانشگاه تهران. صص. 112-118. 2. الهی، علیرضا؛سجادی، نصرالله؛خبیری، محمد؛ابریشمی، حمید. (1388). موانع موجود درتوسعه جذب درآمد حاصل از حمایت مالی درصنعت فوتبال جمهوری اسلامی ایران. نشریه مدیریت ورزشی، شماره 1، صص. 189-202. 4. عسکریان، فریبا. (1383). بررسی وضعیت اقتصادی صنعت ورزش ایران در سالهای 1377 و 1380 (با تکیه بر تخمین GDSP). رساله دکتری، دانشکده تربیت بدنی و علوم ورزشی، دانشگاه تهران. صص. 1-15. 5.Abratt, R., Clayton, B.C., Pitt, L.F. (1987). Corporate Objectives in Sports Sponsorship. International Journal of Advertising, Vol. 6, pp. 299 – 311. 6.Amoako, G.K., Dartey-Baah, K., Dzogbenuku, R.K., and Kwesie, S.J. (2012). The effect of sponsorship on marketing communication performance: A case study of Airtel Ghana. African Journal of Marketing Management, Vol. 4(2), pp. 65-79. 7.Andrew, G., Kasper, T. (2009). A theoretical approach to sport sponsorship. Bachelor thesis, Lulea University of Technology, Department of Business Administration and Social Sciences. p. 36. 8.Chadwick, S., Thaites, D. (2005). Managing sport sponsorship programs: lessons from a critical assessment of English soccer. Journal of Advertising Research, Vol. 45, No. 3, pp. 328-338. 9.Chen, K.K., Zhang, J.J. (2011). Examining consumer attributes associated with collegiate athletic facility naming rights sponsorship: Development of a theoretical framework. Sport Management Review, Vol. 14, pp. 103–116. 10.Coppetti, C.F. (2004). Building Brands through Event Sponsorships: Providing On-Site Audiences with a Vivid Brand Experience. Doctoral dissertation, Universität St. Gallen. P. 15. 11.Cornwell, T. (1995). Sponsorship-linked marketing development. Sports Marketing Quarterly, Vol. 12 No. 4, pp. 13-24. 12. Cornwell, T.B., and Maignan, I. (1998). An international review of sponsorship research. Journal of Advertising, Vol. 27 (1), pp.1-22. 13.Crompton, J. (2004). Conceptualization and alternate operationalization of the measurement of sponsorship effectiveness in sport. Leisure Studies, Vol. 23, pp. 267-81. 14.Crowley, M.G. (1991). Prioritizing the sponsorship audience. European Journal of Marketing, Vol. 25 (11), pp. 11-21. 15.Deloitte, (2012). Annual Review of Football Finance. Deloitte and Touché, London. Pp. 1-15. 16.Deloitte, (2013). Annual Review of Football Finance. Deloitte and Touché, London. Pp. 1-16. 17.Fahy, J., Farrelly, F. and Quester, P. (2004). Competitive advantage through sponsorship. European Journal of Marketing, Vol. 38, pp. 1013-1030. 18.Grohs, R., Wagner, U., and Vsetecka, S. (2004). Assessing the effectiveness of sport sponsorships–An empirical examination. Schmalenbach Business Review, Vol. 56, pp. 119-138. 19.Keshock, C.M. (2004). The effects of economic impact information on the attitudes of potential sports sponsors operating in mid-size and small college communities. For the degree of Doctor of Philosophy, The Florida State University. Pp. 98-111. 20.Maki, D., Sjostrand, N. (2007). Sport sponsorship as a marketing communication tool; a case study of tow B2B Company. Bachelor thesis, Department of Business Administration and Social Sciences, Division of Business Administration and Management. Pp. 33-37. 21.McDaniel, S. (1999). An investigation of match-up effects in sport sponsorship advertising: the implications of consumer advertising. Psychology & Marketing, Vol. 16, pp. 163-84. 22.Meenaghan, T. (2001). Sponsorship and advertising: a comparison of consumer perceptions. Psychology and Marketing, Vol. 18, pp. 191-215. 23.Meenaghan, T., Shipley, D. (2000). Media effect in commercial sponsorship. European Journal of Marketing. Vol. 33, pp. 328-347. 24.Meerabeau, E., Gillett, R., Kennedy, M., Adeoba, J., Byass, M., and Tabi, K. (1991). Sponsorship and the Drinks Industry in the 1990s. European Journal of Marketing, Vol. 25, pp. 39 – 56. 25.Parker, K. (1991). Sponsorship: The research contribution. European Journal of Marketing, Vol. 25 (11), pp.22-30. 26.Picton, D., Broderick, A. (2005). Integrated marketing communication. 2nd ed. Prentice Hall. P. 14. 27.Polonsky, M., Sandler, D., Casey, M., Murphy,S., Portelli, K., and Van Velzen, Y. (1996). Small business and sport sponsorship: The Australian experience. Journal of Promotion Management, Vol. 3 (1/2), pp.121-139. 28.Pope, N. (1998). Consumption, values, sponsorship, awareness, brand and product use. Journal of Product & Brand Management, Vol. 7, issue 2, pp. 124-136. 29.Roy, D. and Cornwell, T. (2004). The effects of consumer knowledge on responses to event sponsorships. Psychology and Marketing, Vol. 21, pp. 185-207. 30.Schuman, P. (1986). The power of perceptual marketing; an analyzing of sponsorship as components of marketing and corporate relations programs. New York University. Pp. 76-86. 31.Scott, D.R., Suchard, H.T. (1992). Motivations for Australian Expenditure on Sponsorship – An Analysis. International Journal of Advertising, Vol. 11, pp. 325 – 332. 32.Seguin, B., Teed, K. O’Reily, N. (2005). National sport organization and sponsorship: an identification of best practices. International Journal of Sport Management and Marketing, Vol. 11(4), pp. 283-301. 33.Smith, G. (2004). Brand image transfer through sponsorship: a consumer learning perspective. Journal of Marketing Management, Vol. 20, pp. 457-74. 34.Thwaites, D. (1995). Professional football sponsorship – Profitable or profligate? International Journal of Advertising, Vol. 14 (2), pp.149-164. 35.Thwaites, D., Aguilar-Manjarrez, R., and Kidd, C. (1998). Sports sponsorship development in leading Canadian companies: Issues and trends. International Journal of Advertising, Vol. 17 (1), pp.29-49. 36.Tripodi, J.A. (2001). Sponsorship-A Confirmed Weapon in the Promotional Armory. International Journal of Sports Marketing & Sponsorship, Vol. 13, pp. 17-31. 37.Wakefield, K., Becker-Olsen, K. and Cornwell, T. (2007). I spy a sponsor: the effects of sponsorship level, prominence, relatedness, and cueing on recall accuracy. Journal of Advertising, Vol. 36, pp. 61-74. 38.Walliser, B. (2003). An international review of sponsorship research: extension and update. International Journal of Advertising, Vol. 22, pp. 5−40. 39.Walshe, P. (2008). Managing the Sponsorship Mix. Journal of Sponsorship. Vol. 2, No. 1, pp. 43‐48. 40.Weeks, C. S., Cornwell, T. B., & Drennan, J. C. (2008). Leveraging sponsorships on the Internet: Activation Congruence and articulation. Psychology & Marketing, Vol. 25(7), pp. 637-654. 41.Woodside, F., Summers, J. and Johnson Morgan, M. (2006). Sponsorship of fast moving consumer goods – does packaging endorsement contribute to brand attitude. A conceptual paper, in International Conference of the Academy of Business Administration, 2006 Munich, Germany. Pp. 1-10.